Welcome to our gallery featuring the Oasis home by ARS-IDEA Interior and Architectural Design. The coherent design of this home is striking in both its material and textural variety. The designers met and exceeded the challenge of making an open plan space feel varied and interesting. 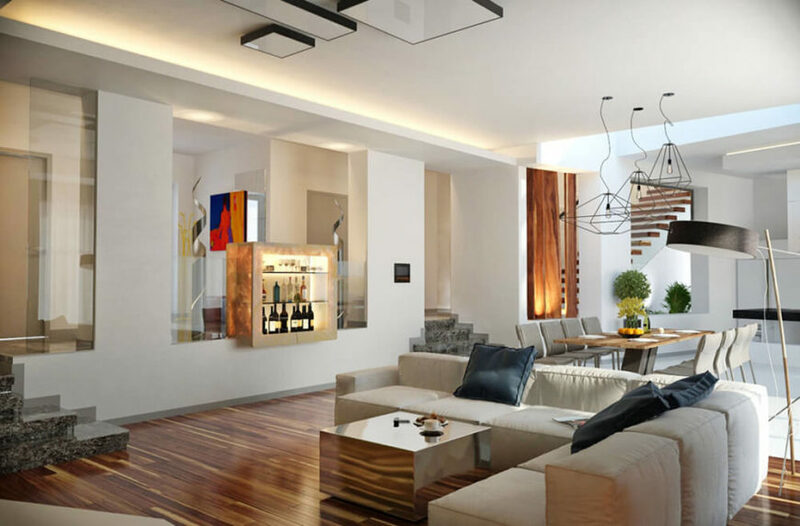 In this startlingly modern interior, the high contrast mixture of elements creates a visually rich, stylistically dense space that nonetheless looks comfortable and convenient to live in. This innovative interior design plan is the result of work by the highly experienced and passionate design team at ARS-IDEA. The group has completed over 150 unique projects in the past decade, and has built a reputation for challenging, expressive design work. As with every project they take on, ARS-IDEA collaborates directly with the client, resulting in a home that reflects its owners with precise execution, top quality, and passion to spare. 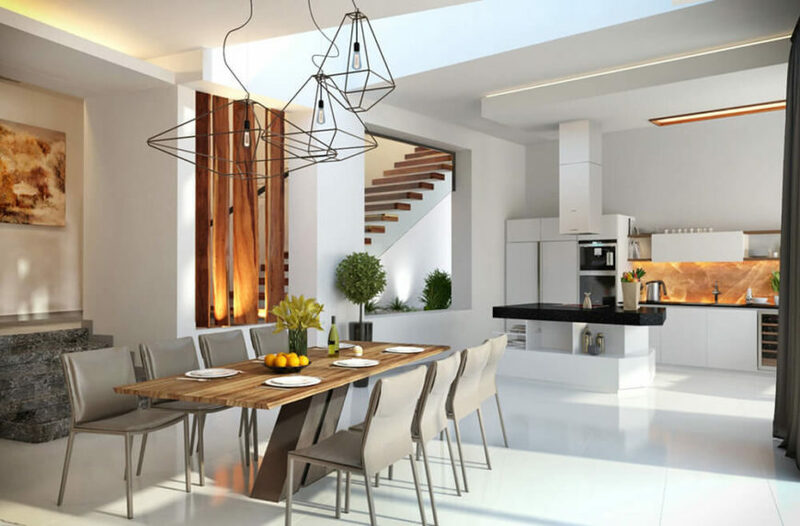 In this case, we see rich natural elements like wood meeting sleek white spaces, with striking but subtle use of recessed lighting throughout. The entire space is framed in layered, angular elements. This thoroughly contemporary style is matched with a detailed sense of scale and texture, with artful lighting, furniture, and layout choices made throughout the interior. 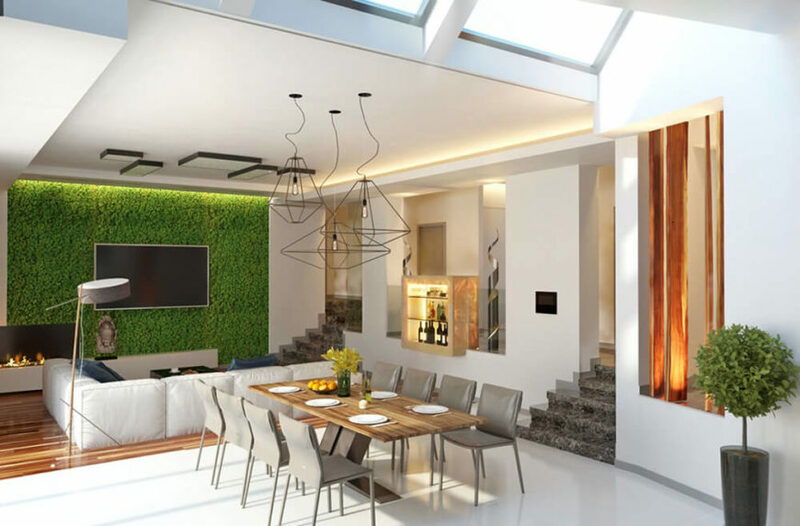 However, the most striking single element within this home is the full height living wall at the far end of the open plan living room, dining, and kitchen area. This brings the fresh greenery of a garden indoors, in a neatly modern fashion. Throughout the rest of the home, small patches of greenery appears, continuing the theme. 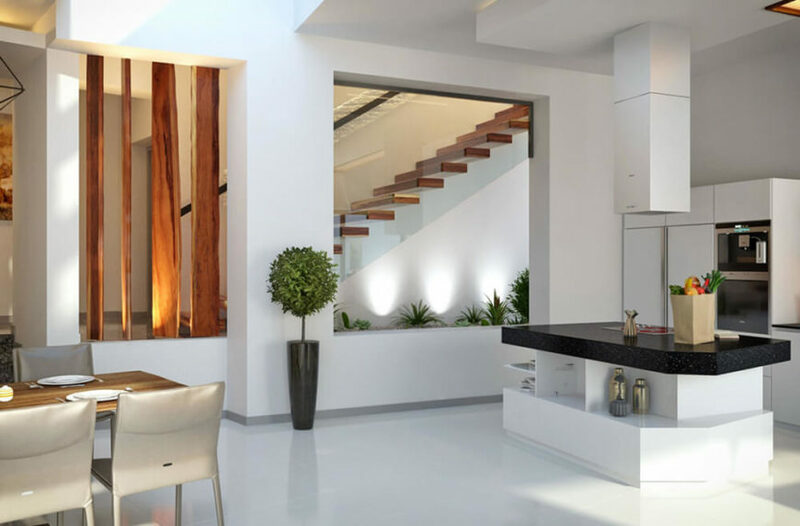 The large central area of the home mixes living, dining, and kitchen functions within the same set of walls. 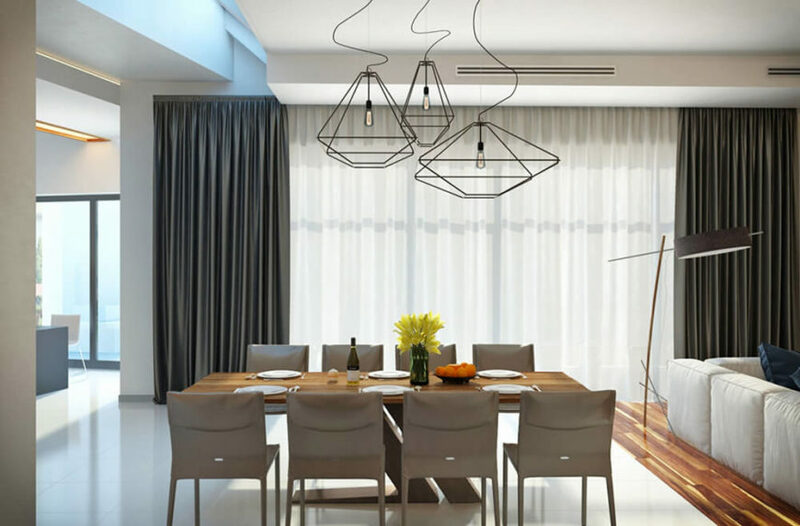 Here the striking, modern hardwood dining table stands in contrast with its stark white surroundings. 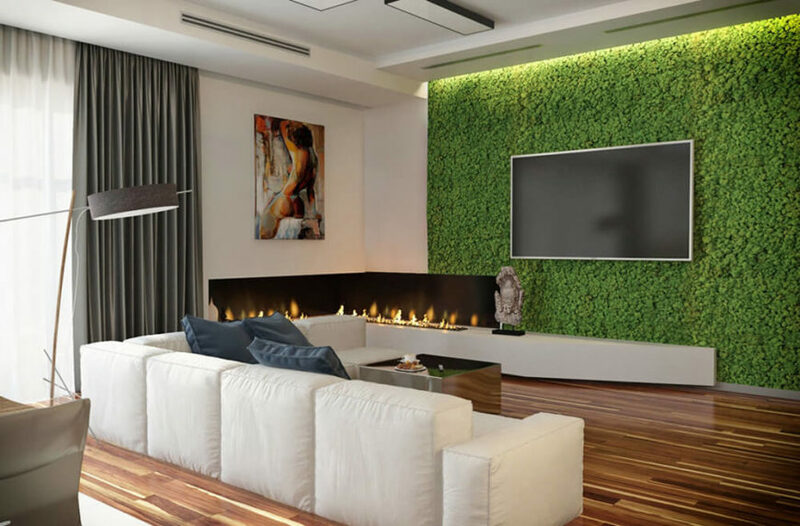 Looking toward the living room area, we see a flat panel TV mounted on the full height living wall, surrounded by greenery and lit from above. This startling element gives the modern space a more textured, timeless appeal. Surrounding this space is a set of large, full height windows and sliding glass panels, which offers abundant natural light throughout the open plan interior. 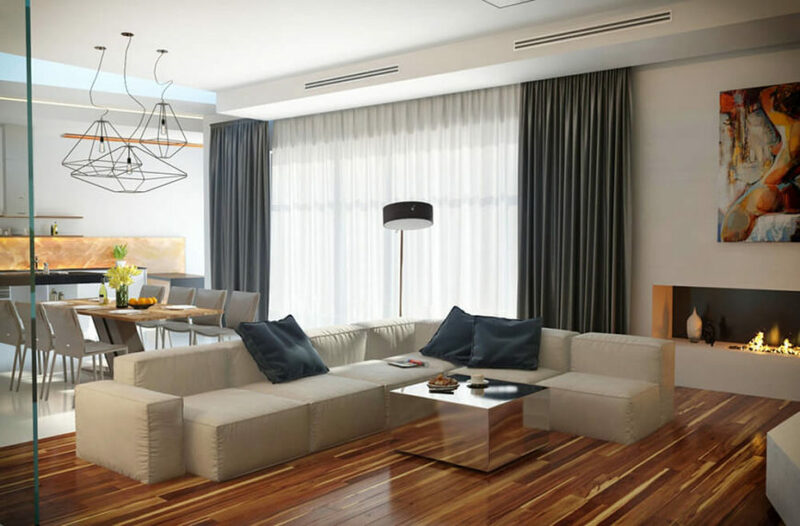 In this broad open space, we see a mixture of distinct elements, including hardwood flooring. white tile, and massive glass panels dividing the hallway. The large, cushy white sectional here stands in sharp contrast to the sharp mirrored coffee table at center. Juxtapositions like this define the look of the home interior. Here’s a much closer look at the living wall, bordering a corner with an embedded gas fireplace as well. Lights tucked into the ceiling make the greenery positively glow. 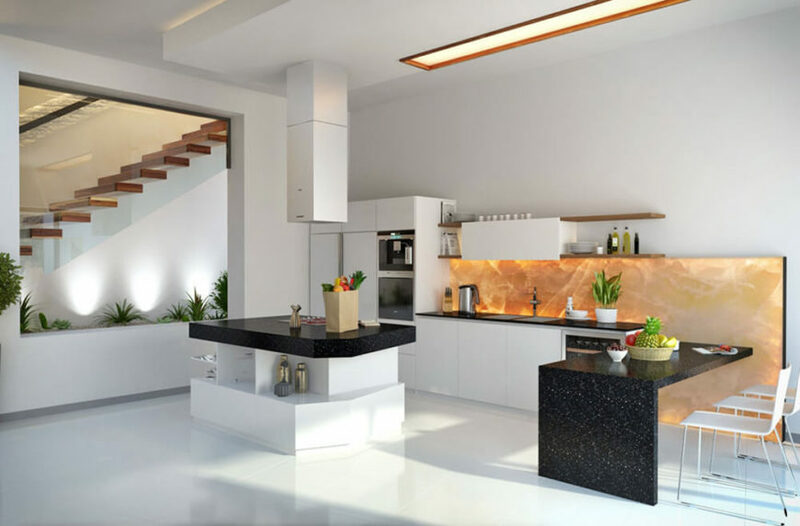 Closer to the kitchen, we see another element – dark quartz countertops – introduced, as well as a glowing amber toned accent wall in the background. 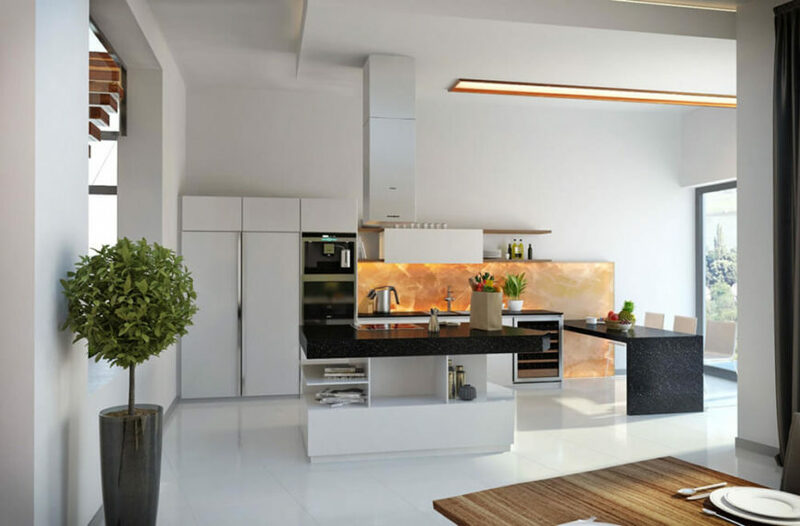 The large island defines this area within the larger open plan space. That glowing amber wall makes for a startling design element, standing out even within the striking contrast of this home. The small countertop at the right offers space for in-kitchen dining. 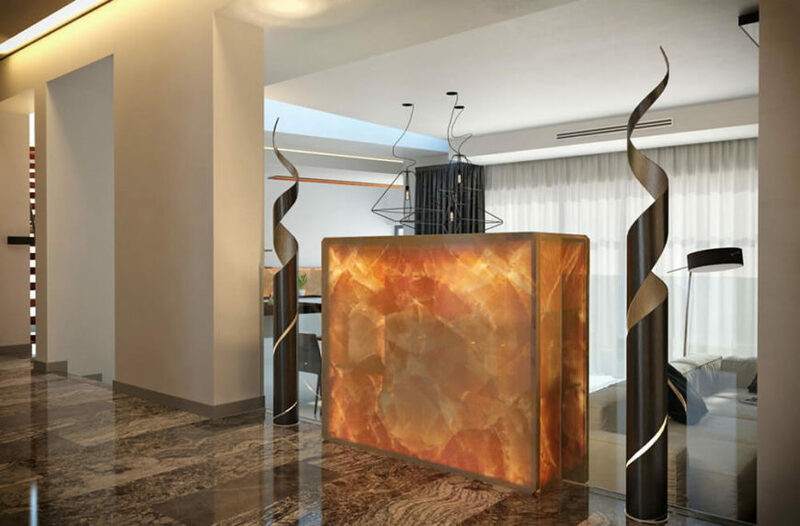 Seen from the hallway, the glowing drink shelf in the living room is another bold example of the amber stone element, standing out amidst the sleek surroundings. 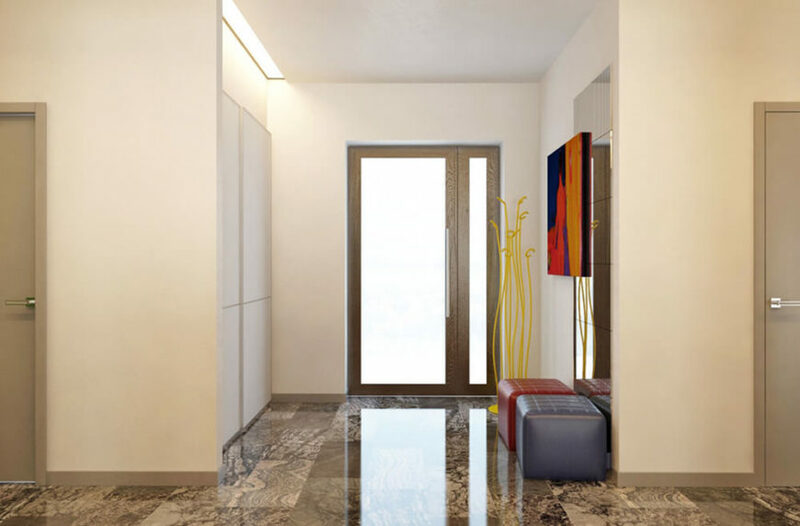 The hallway features dark marble flooring. Looking toward the entryway, we see a more sedate and comfortably neutral color palette. This striking home eases visitors into its style.